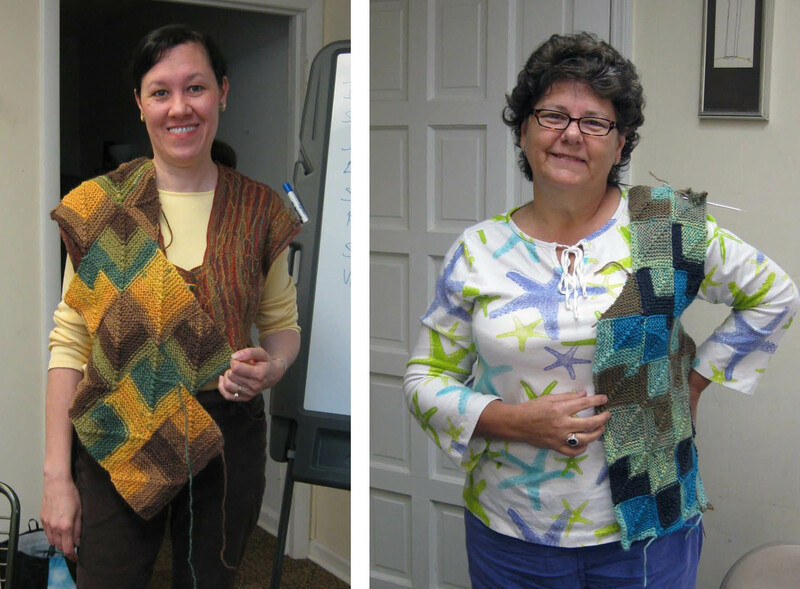 I met with the participants of my Mitered Diamond Adventure modular knitting workshop for the final class session yesterday. I refer to this wonderful and talented group of women as the "Diamond Girls," and there was no doubt about the stellar work they did on their class projects. The Mitered Diamond Adventure is a knitting workshop I offer that introduces participants to the concept and techniques of modular knitting. 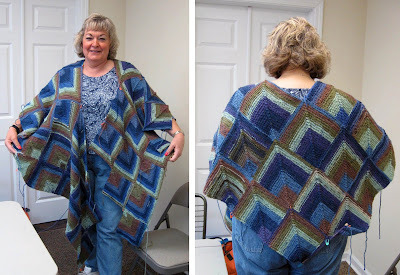 We work primarily with mitered squares and mitered diamonds (squares set on point) and the Mitered Diamond Shawl pattern by Michael del Vecchio is our inspiration impetus. Deluxe Worsted Long Print by Universal Yarn, a 100% wool worsted weight yarn with long color changes, was chosen for the project. 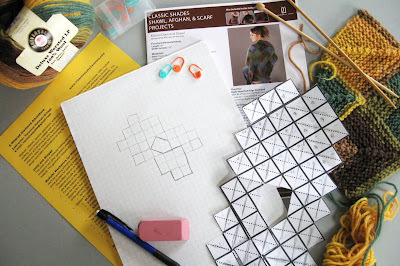 After providing instructions on knitting a mitered square in Session I, students practiced the technique and on their homework swatches. In Session II, I presented my "It's Cool to be Square" visual presentation on modular knitting that included garment silhouette possibilities and design opportunities. Session III was a troubleshooting and review session, an idea exchange, and of course, Show and Tell. For their project, each student chose her own garment style. The projects included wraps, vests, and runanas. Here is a show and tell of their creativity and the progress they made. Lois completed her mitered square vest. The long color changes add a striking detail at the neckline, hem and sleeve edges. Sharon designed a ruana by opening the front of a poncho silhouette. The larger squares focus on the color changes of the yarn. 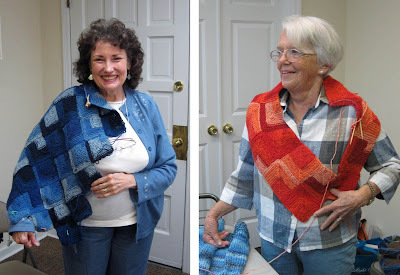 Left: Irene designed a long wrap in a "V" shape. The hemline shows off the points of the mitered diamonds. Right: Pat chose a long, rectangle wrap using mitered squares. In contrast, the edges of this wrap are straight. cascade from the neckline. CO = 25, 31 and 35 sts. Color: Sea and Sand. 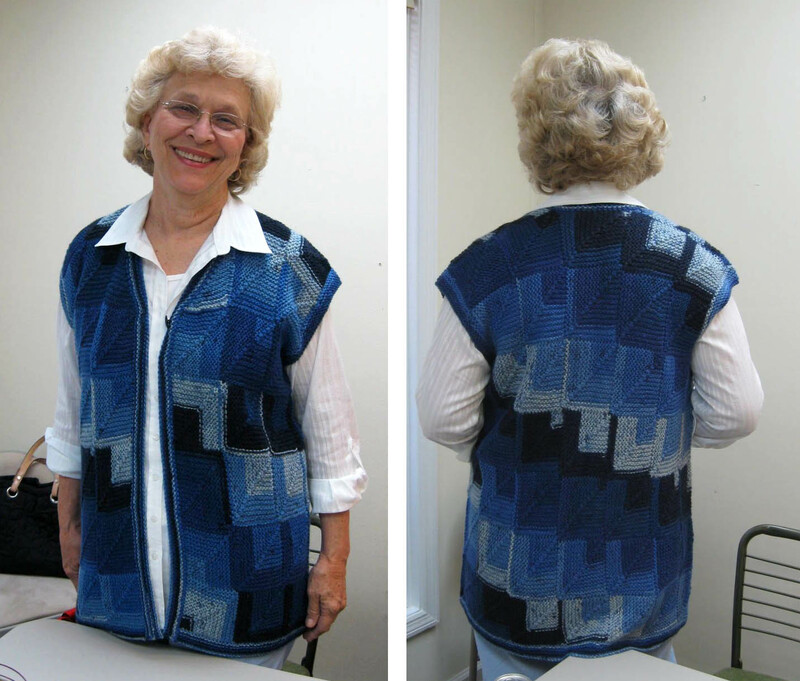 Jane kept the color values more consistent by cutting out the navy from the color sequence. Susan hit the "sweet spot" in the color change sequence. The colors in her modules are very consistent which accentuates the symmetry of her design. Left: My (Veronica) design is a caplet. The center double decrease miters make right angles in the front and back. 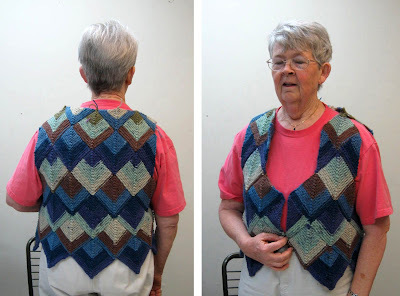 Right: Sharon chose a mitered square vest. The smaller units create a different color pattern. Aren't all these pieces Fantastic?!? When I was planning and creating this workshop, I wasn't sure where the exercises might lead the student. I wanted workshop participants to get a good understanding of modular knitting techniques and the process for knitting and assembling the units, but to also provide an encouraging and creative environment in which the knitter could take a step or two beyond the pattern, if she/he chose. The fun and excitement for me (as a teacher as well as a knitter), is having the opportunity to take an adventure down a path less traveled... even if it requires some detours and problem solving. To be able to see sights that were not on the original itinerary and experience the joy of discovery... that's half the fun for me. These garments far exceeded my expectations. And I feel confident that I achieved my goals. Thanks to my students for taking this Modular Knitting Adventure with me. You are all shining stars! This workshop was sooooo much fun! 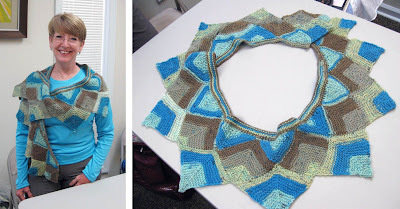 Thanks, Veronica, for continuing to teach and challenge us with new and exciting projects! Love all the different pieces your students made. Fantastic work!